Now that the 8.5 cogs are set in motion, all what's needed is the eagerly-awaited Mess Patch, with its 80+ features to help you make Messenger your own. So what's new in this release? - Another HOT exclusive option that transforms your conversation window to look like the contact list (see screenshot here). - A new option to remove partner links from the display picture window (as requested by Markus). - Patching profiles have been removed. - Bug fixes: Dynamic display pictures now appear properly when viewing full-sized display pictures in the contact card (reported by the andyman), in addition to a dozen of other minor bug fixes. Worthy of your attention, is that this version of Mess Patch shows a license agreement page if any of the ad-removal options is selected. Advertisements are what keep Windows Live Messenger free and we discourage messers from removing them. Please make sure you read the license agreement thoroughly. UPDATE: Some messers reported that their Messenger Plus! icons have disappeared from the contact list after patching Messenger. Therefore, a tiny update has been issued to address this problem. If you've already downloaded Mess Patch, then get this update via the auto-update feature, or through on the updated link below. >> Download Mess Patch for Windows Live Messenger 8.5.1235.517. PS: This is an English-only version of Mess Patch, expect a multilingual release sometime next week. "As I didn’t want to force you to choose between testing a new Messenger and trying to win one of the great prizes of the 6th anniversary contest, I spent the last 2 days working on some quick fixes for the beta. Messenger Plus! Live 4.22 adds support for Messenger 8.5.0517 and that’s about it; some bugs were fixed too but not that many." >> Download Messenger Plus! Live 4.22. For the price of a single Wink or an Emoticons Pack, you can download all Messenger content for free today at Mee-Zone. Just buy 10 MeeTokens with your Credit Card (US$1.50) or PayPal (US$0.95) and you can start hoarding up high-quality Winks, Emoticons, Display Pictures, Backgrounds, and Theme Packs. This offer lasts until the end of today, but whatever you download will be stored on your PC for future use with that same Messenger account. Apparently this is the second "Free Day" at Mee-Zone after one on May 1st. Maybe July 1st will be the third? Another Microsoft partner, Kiwee Canada, has already been offering its entire collection of Messenger stuff for free non-stop since October last year. The twist ending of The Others? Spoiled by my girlfriend. The fifth season of 24? Spoiled after a simple Google search for "Jack Bauer". "Rosebud" never was a mystery to me. My film history teacher spoiled that one beforehand. Sometimes I'm a split second too late to shut my ears when somebody is about to reveal a surprise movie ending, and I just HATE it when that happens. So, if you want to be a real brat and completely ruin a movie for your contacts (or to put it differently, save them the price of a movie ticket) then this set of display pictures is for you. Based on the Spoilt t-shirt design by Oliver Moss, here are 18 display pictures that spoil the ending of Star Wars, Planet of the Apes, The Usual Suspects, The Crying Game, Harry Potter, The Sixth Sense, Dallas, The Matrix, Fight Club, 300, Citizen Kane, The Others, Psycho, Soylent Green, The Village, A Beautiful Mind, Donnie Darko and The Wicker Man. Needless to say, if you're still planning to see one or more of these movies for the first time you should be careful browsing the set. I added the Star Wars one to this post because I think I can safely assume all of you have at least once heard the "I am your father" quote. >> Browse the Movie Spoilers display picture set. By the way, there's a Summer Vacation Sale going on at Threadless, with most t-shirts priced just $10 until June 3rd. Interested in developing custom extensions for Windows Live Messenger but don't know where to start? Joel Reyes, Microsoft Public Sector Developer & Platform Evangelist, is inviting all curious developers to register for tomorrow's 90-minute webcast about building add-ins. The event starts Friday, June 1st at 11:00 AM Eastern Time (what time is that for you?). "Messenger has evolved into a full-blown platform for communication. We see messenger-aware applications everywhere. We have also seen specific application of messenger technology for Customer Service integration. So we have seen messenger invading other apps. How about the reverse? Extending Live Messenger so that it can offer context specific interaction with users. Live Messenger AddIns are the key to this new exciting possibility. Creating AddIns for messenger is in its early stages, but it has enough capability for us to have some fun with it. Join me to play with Live Messenger Addins.We will explore the requirements and steps to creating AddIns in Visual Studio that plug into Live Messenger. We will learn about the Live Messenger API by extending Messenger via an Addin." >> Register for the live webcast event here. >> Audio conferencing at +1 (866) 500-6738 (participant code: 7545634). Quickly following the few days old leak of an internal 8.5 build, Microsoft is officially releasing the beta version to the masses. No need to download it from shady locations any longer! It is exactly the same version (8.5.1235.0517). In addition to the brand new and Aero-supporting user interface we've showed you in earlier screenshots, LiveSide reports another novelty in this version: the integration of Windows Live OneCare Family Safety which allows parental control over signing in and adding new contacts. Log into OneCare Family Safety, click "Edit Settings" and scroll to the bottom for the Allowed applications (Beta) section. Of course, Mess Patch is in the works for brutal Windows Live Messenger 8.5 modification. >> Download Windows Live Messenger 8.5 Beta (English/US). >> Download Windows Live Messenger 8.5 Beta (English/UK). >> Download Windows Live Messenger 8.5 Beta (English/India). 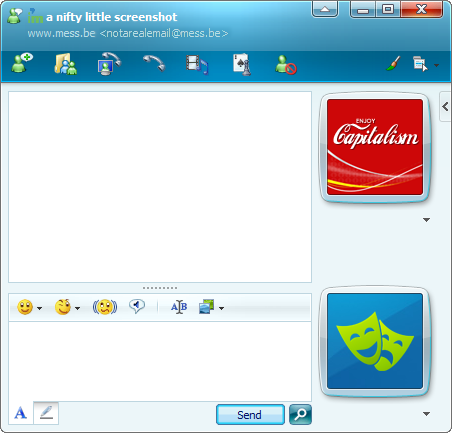 >> Download Windows Live Messenger 8.5 Beta (French/France). >> Download Windows Live Messenger 8.5 Beta (German). >> Download Windows Live Messenger 8.5 Beta (Spanish/US). 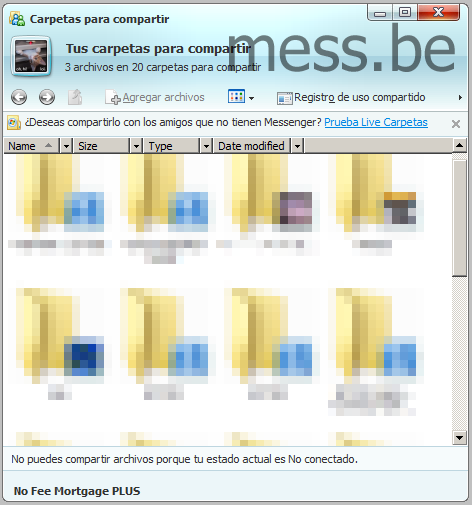 >> Download Windows Live Messenger 8.5 Beta (Spanish/Spain). >> Download Windows Live Messenger 8.5 Beta (Chinese - Simplified). >> Download Windows Live Messenger 8.5 Beta (Japanese). >> Visit the Windows Live Messenger 8.5 Beta homepage. Just a quickie... According to mad.co.uk, former Microsoft marketing head Jonathan Hulse has been promoted to director of Windows Live, overseeing the Windows Live platform which includes Windows Live Hotmail, Windows Live Messenger, Windows Live Spaces and leading the evolution of the products. UPDATE: Former Windows Live director Phil Holden has hopped to Mobile as he announced here. Thanks to Chris for that bit of info. After sniffing around in Windows Live Messenger 8.5 we have discovered that the new client promotes a new product, called Windows Live Folders, in the Sharing Folders window. At the moment the promotion will only show up in the Spanish build of 8.5, and only after modifying a configuration file. Windows Live Folders is a service which allows you to upload files to a personal (and/or public) folder hosted by Microsoft. The fact that Windows Live Messenger is promoting Windows Live Folders might indicate a tight integration between the two services. It also indicates that the Folders BETA will most likely go public alongside of the next Messenger BETA. >> About Windows Live Folders by LiveSide. Avoid tampered Windows Live Messenger 8.5 installers! The problem with leaks is that a lot of mirrors pop up out of nowhere and you can never really trust them to still provide the authentic stuff. In this case, even the proclaimed leaker abused its increased popularity to bundle ads into the Windows Live Messenger 8.5 installer at the disadvantage of you guys. In order to protect overexcited but unwary Messers from compromising their systems with unwanted garbage, I'm going to refer to the rather popular Digg of our story (hijacked by a Neowinian apparently!). In its comments you'll find a dozens of mirrors but there's one in particular that can be trusted. Note that we always advise against downloading leaked internal or beta builds, but with attention that this leak is getting in the blogosphere we can only ring the alarm for the inevitable group who gives the cold shoulder to our advise. What we do recommend is that you all sign up for the official new Windows Live Messenger beta program over at connect.microsoft.com (thanks for the link the.exe.ecutioner & anonymouse91). If you get selected, you'll be able to voluntarily but actively participate in the development of your favorite IM software. Sounds just like the job for you, am I right? Today an internal build of Windows Live Messenger 8.5 was leaked by Messenger Addictos, a site dedicated to Windows Live Messenger and related products. The new build includes a completely new installer system (though it appears it might need some tweaking). Messenger itself also got a complete overhaul, featuring a new UI that combines the best of Windows Live and Vista. The new build also includes several minor new features, some of which are still undisclosed. Unfortunately support for Plug-Ins (or "Add-Ins") has been dropped. The leaked build is only available in Spanish at the moment, but if you managed to download it somewhere, you can copy the old language file ("msglang.dll") of Windows Live Messenger 8.1.0178 over the new one ("msglang.8.5.1235.0517.dll"). Note that the installation directory has also been changed to "C:\Program Files\Windows Live\Messenger\" making the transition from MSN Messenger to Windows Live Messenger complete. Note: The new build does not appear to be compatible with Messenger Plus!, so if you have obtained the new version somewhere then you won't be able to compete for cool prizes in the Messenger Plus! Live competition, mentioned earlier on Mess.be. UPDATE: Many of you have reported an easy workaround to make Plus! work with 8.5, although it's not 100% effective. UPDATE: Thanks to Scott for informing us about the new "Bunny" emoticon in 8.5: . The shortcut for this new emoticon is ('.'). Messenger Plus! Live contest... live! Messenger Plus! Live's 6th Anniversary Contest has gone live yesterday and all you need to do is download and install its latest version (4.21), click the gold Messenger Plus! logo in your contact list or select "Play and Win!" in the Plus! menu. This will bring up the game grid where you can start hunting for prizes such as major gaming consoles, LCD computer screens and Plus! merchandise. The contest will last three weeks with a new batch of prizes every week. >> Download Messenger Plus! Live v4.21.